Even if someone has acne and does not agree with my advice, that is perfectly fine with me. No gun is being held to anyone’s head to listen to me and my ramblings. I have been wanting to write about sugar in general. I have to come to realise that it is bad for your health whether you have acne or not. Like it or not most of us love the sweet stuff. Given a chance I can sit and eat a whole cake one slice at a time. However, it is the fear of developing deep painful acne on my face, which keeps me from doing something like this. Trust me, if I got acne on my back only and not my face, it would have been a different story. However, what about someone who does not have acne. What is their motivation for giving up on the sweet stuff? First, let us analyse the comment that “People have been eating sugar for hundreds of years.” No, they haven’t. Sugar is not found in nature. 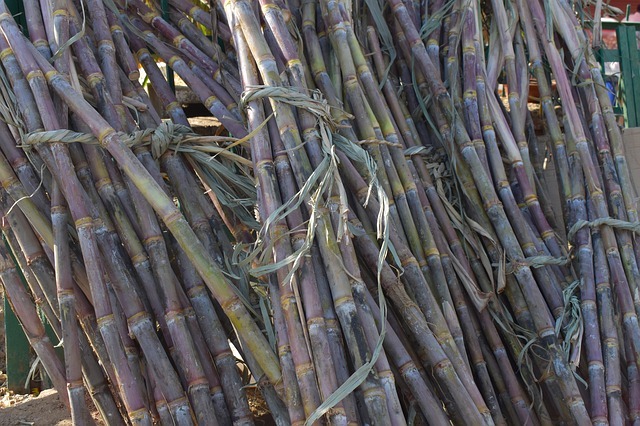 It is a byproduct of sugarcane, which as you can see below, is very fibrous. I doubt this is meant to be eaten by humans. It is almost impossible for the human jaw to eat this. At the most maybe you can chew off a small amount. Today we have powerful machines which crush these tough, fibrous stems to extract the juice from them and convert them into sugar. Unfortunately for us, our bodies have not evolved to cope with the massive amounts of sugar we now put into it. 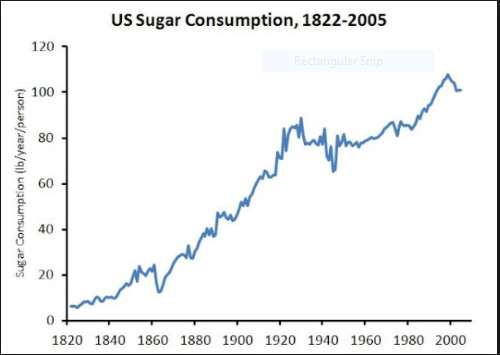 Check out the graph below to see how sugar consumption in the US has increased over the years. This graph is for data in the US alone. However, I am pretty sure the graph of other countries looks very similar. Imagine that. In the year 1820, a person ate about 2.8 kilos of sugar per year. In the year 2000, that number has increased to 48 kilos of sugar per year. The fact is the amount of sugar being consumed by one person in a whole year in 1820, was being consumed in about 3 weeks in 2000. Our bodies are struggling to cope with this huge change. How exactly does excess sugar lead to weight gain? Now there is a hormone called leptin. This hormone tells you when you have enough food. It then signals your brain to tell you that you are full. When you consume excess sugar this hormone does not work as it should and you end up consuming more food than you need. This excess food leads to weight gain. High sugar diets will put you at risk for developing diabetes and heart disease. High sugar foods increase the production of AGE’s ( Advanced Glycation End Products ) which make your skin age faster and damage the collagen which keeps your skin smooth and plump. I always thought fatty liver was associated with a high intake of alcohol. Until my husband, someone I knew who never drank any alcohol was told he had it. Then I got to know that it was actually called non-alcoholic fatty liver disease. It was a mystery to me until he quit eating loads of chocolate due to a dairy allergy and stopped drinking bottles of soft drinks. At his next physical he was told he did not have it. So yeah, an increased intake of sugar, especially sugary drinks may lead to a fatty liver. This is the place where I get the most push back. I can safely tell people that high sugar diets may put you at risk for diabetes and heart disease. But the minute I say that acne may also be caused by a high sugar diet I get some form of disbelief from people. Excess sugar causes hormonal imbalances and high inflammation both of which make it more likely that you will get acne. As a teen growing up in India I had never heard of PCOS. In my twenties almost every second person I knew had it. Most women I talked to at work had some issue with their menstrual cycle. Some were losing hair because of it. Some were gaining weight. Still, others had excessive facial and body hair. These days I know a lot of women who have to have laser treatments to get their facial hair removed. What has changed in the last 10-15 years that suddenly an increased number of women have PCOS? Insulin resistance is one of the root physiological imbalances in most, if not all, PCOS. This is where your pancreas needs to pump out more and more insulin in response to high blood sugar levels. Insulin lowers the blood sugar by storing the glucose in cells. The cells become resistant to the constant insulin and need more to be signalled to lower the blood sugar. When this resistance goes on for a while, you have high insulin and high blood sugar. It turns out that research shows many lifestyle changes can pull someone out of the metabolic chaos of PCOS, and decrease her chances of developing co-morbidities such as diabetes, heart- disease, hypertension, sleep apnea, anxiety, depression and infertility. I asked a young girl, who I knew was struggling with PCOS, about the treatment she was getting from her doctor. She mentioned she was on birth control pills. I asked her if she was better taking them, she said no. Now the next piece of “medical advice” is something that can happen only in India. The doctor told her “It will all settle down after you get married.” There you have it. Getting married is the cure for PCOS!!! Newsflash: She has been married for 5 years now and it has still not “settled down”. Now, this girl was in serious depression because of her condition. She had bald patches on her head and she was rapidly gaining weight. I used to ask her if her doctor had asked her to make any changes to her diet. She said no every time. I asked her if she considered giving up the chips and soft drink diet she lived on. She looked very sceptical. All that you read above are just some of the really bad negative effects of sugar on the body. With acne, you can see what is happening because of excess sugar consumption. It is right there on your face. It affects your self-esteem. People are more likely to try and change their diet to cure it. Acne is not life-threatening. Diseases like diabetes and heart disease certainly are. And the problem is they are silent as they happen within your body. Unlike acne, you do not get a clue as to what is going on within your body. However, as with any disease, the overall quality of your life goes down. Acne, which while certainly not life-threatening, makes you feel bad about yourself and your skin. With diseases like diabetes, you have to take medication every day to keep it under control. I quit sugar in 2013 and have never felt better. It was certainly hard initially and I will admit, it still is hard when I see sweets and desserts I absolutely adore. I do allow myself a weekly treat of something I love. I can now eat a small number of sweets without breaking out. But I will never ever go back to eating desserts every day. 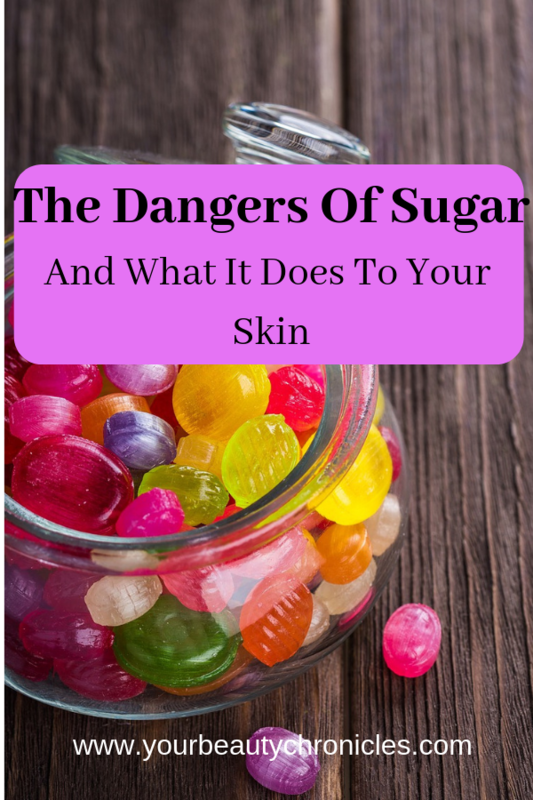 You can read about my experience with sugar and acne here. I also wrote an article on quitting sugar here.